Bedding linens are exceptionally important because they add a beautiful touch to the particular room. Manufactured with high quality fabric like cotton, they are exceptionally decorated with a variety of prints as well as embroidery. Crafted entirely from natural fibres, they stand to be of exceptionally beautiful. Along with this, such forms of linens are demanded for resistant prints and vibrant shades. Such forms of bedsheets have the ability to enlighten the interiors of a bedroom or living room, wherever it is spread. Moreover, the best part of buying Jaipur style bedsheets is that they have a longer life than other forms of bedsheets and rooted in traditional style. Their sheer beauty and elegance is simply majestic. These bedsheets are suave in touch. The beauty of Jaipur bedsheets are widely evident from the shades used by them and the work crafted is beyond any kind of explanation. Well stated, Rajasthani crafts developed in bedsheet are more vibrant and stylish because of the art form. With the changing trends, the Rajasthani art has retained its glory by making use of brighter shades on the plan base for making designer bedsheets. 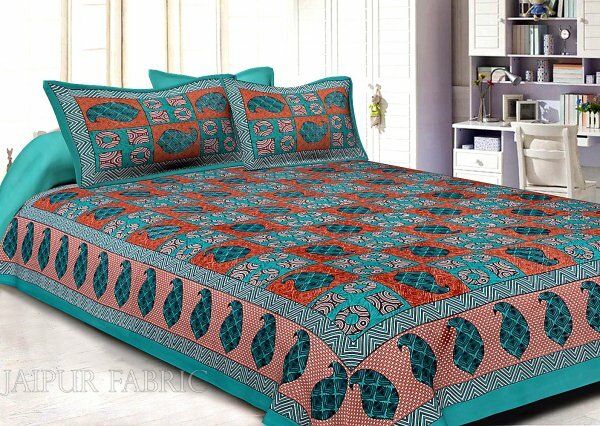 One of the prominent forms of bedsheets is the masterpieces adorning Bandhani Print. Stated to be a form of tie and dye print, the Bandhani bedsheets are quite in fashion. In fact, they never go out of style. Such types of prints have managed to attract people around the world. Apart from the Bandhani prints, other ones are said to be leaf prints. Being a famous part of Jaipuri bedsheets, these ones are usually printed on the white based foundation. Further to this, the borders are exquisitely and intricately printed in vivacious shades. These prints are found in green tones and even blue shades because of the colors look simply magnificent on a white background. There are numerous websites that offer quality bedsheets at affordable prices. The best thing is that such bedsheets come within the budget and adds beauty to the room. Every individual has own preferences and likes. But, the bedsheets from the state of Jaipur are such that they have been cherished by all. Each person ensures that they get the best of products without difficulty. For this, online hunting is always preferred as it unleashes more variety than the one in emporiums. Jaipur is known for excellent printing technologies and patterns, which are famous on global basis. This is the reason that the bedsheets from such a place is gaining momentum. Tie and dye is one of the famous styles used to imprint bedsheets with exotic patterns . To provide diverse styles, the modern method makes use of numerous kinds of folds. One can have the Spiral designs by pleats of fabric decided in swirls about a central point. The experts tend to fold the cloth piece half precipitously, crafting a line slantwise to get the V shaped pattern. This allows expert craftsmen to have Random styles and Random circles through such a wonderful technique.